Las Tortugas Condominiums are spacious and beachside -- Only a short 5 minute walk to the town square & the widest and whitest of Puerto's beaches is just out your door!! Las Tortugas is a small enclave of 9 condominiums with a pool, hot tub, lounge chairs, and shade palapa for outdoor enjoyment. Located on the beachside of the main street in Puerto, you'll leave the complex and are just steps to the ocean and sand. The condo features full size appliances and a spacious kitchen. The kitchen, dining, and living areas are combined in an open floor plan. The living room has a TV set with DVD player (no cable). The master bedroom suite features a comfy king size bed, spectacular ocean views and breezes, private bath, and private balcony. The guest bedroom features a queen size bed. Washer and Dryer provided for your convenience. Upgraded finishes, custom tropical hardwood cabinetry, granite counters,common area wi-fi internet, and extensive lush landscaping make this a relaxing tropical retreat. Mid-Week Maid Service is included with weekly rentals. Additional cleanings available on request. 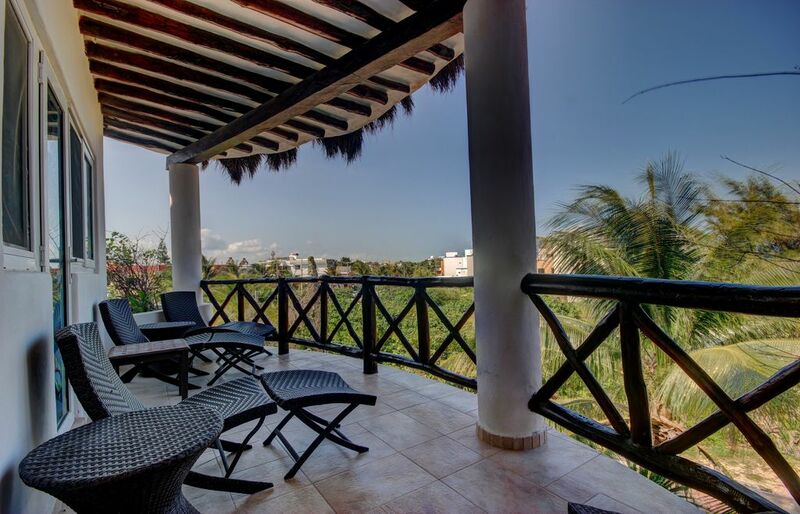 We are conveniently located in the Puerto Morelos Town Square, and care for this privately property on behalf of the owners. As our guest, you have access to our Concierge who can help you plan your trip, your tours, or book fun services like an in-house chef's dinner! Additionally, we are there to answer your questions and address any concerns you might have during your stay. Enjoy the convenience and peace of mind in having a local representative there to assist you on your vacation! Bikes, Children's Items, Cellular Phones are Available to Rent through the Office. Personal Concierge Service is also provided at Rental Office. Mid-Week Maid Service is Included. Additional Services are Available per Request.